I was watching peregrines in Wakefield city centre this afternoon when I saw a bird flying over the lower end of the precinct. 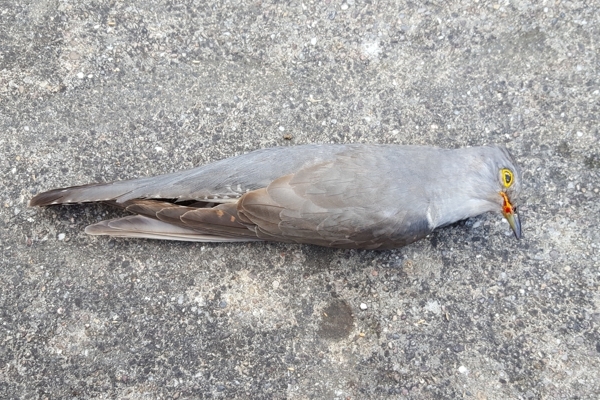 I saw it only briefly but I said to those around me, “I think I’ve just seen a cuckoo.” About thirty minutes later, a member of the public approached me to tell me about a dead bird that he had found next to his car, which was parked near The Spaniard. He knew that it was something unusual and he mentioned that he thought it might be a cuckoo. 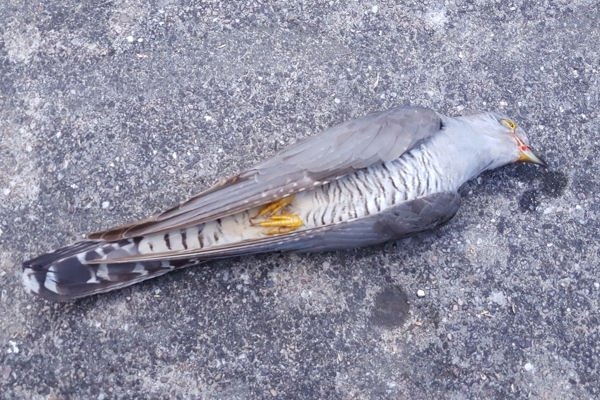 I walked around to the car and I found that there really was a dead cuckoo. There were no marks on the bird and I assume that it flew into something. I’ve spent many hours over several years watching peregrines in Wakefield and I’ve seen a number of other bird species but this is the first cuckoo that I’ve seen. How strange that it should die so soon after being spotted. The good news is that the cuckoo will enter the natural history collection of Manchester Museum as a preserved skin. The skin will be available for people to study now and for many years to come. 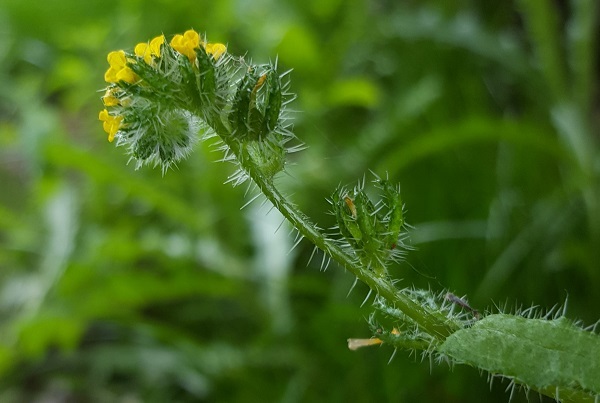 During a walk at Ackworth School a couple of years ago, members of Wakefield Naturalists spotted an unfamiliar plant which turned out to be common fiddleneck. This plant is an annual that was introduced to the UK from North America. It’s quite common in East Anglia but is localised further west and north. At first, I thought that it had been introduced along with some building material but I recently found numerous plants in the dry, bare ground beneath a large Lleylandii and I now wonder whether it has been growing at the school for much longer. Its preference is for dry and sandy soils. 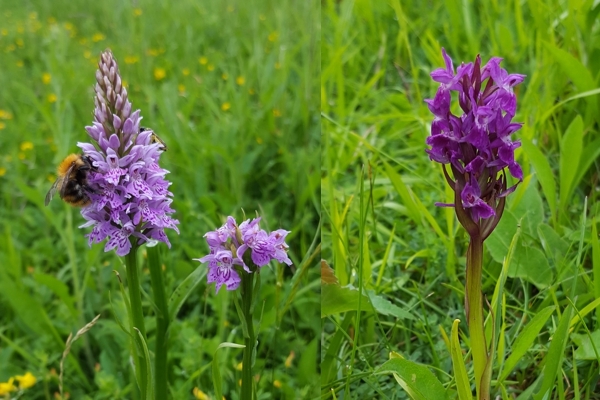 The recent weather hasn’t encouraged flowers to open but the common spotted orchids looked about to put on a show and we found one or two in flower. There was also a flower remaining on an early purple orchid. A few insects were around. 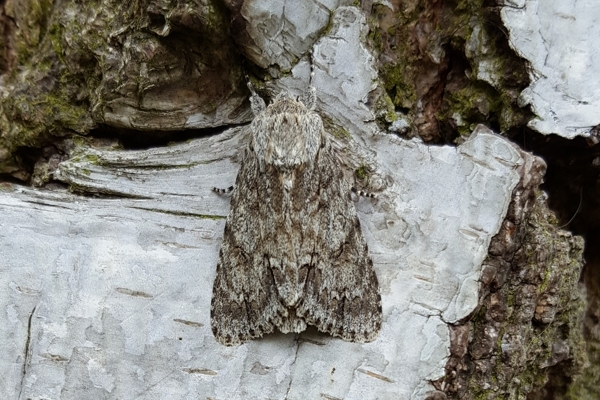 Someone located a sycamore moth on the suitably coloured background of silver birch bark and John spotted the caterpillar of a six-spot burnet moth. 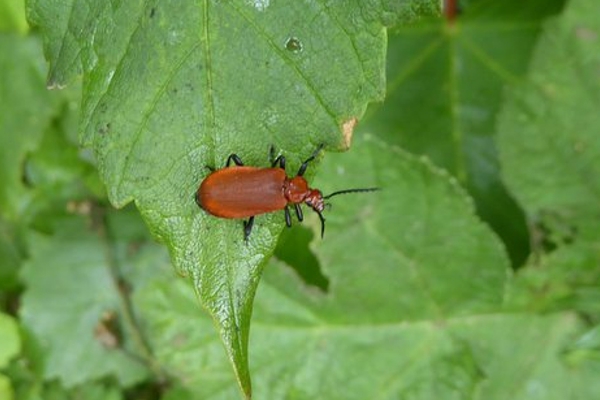 Also seen was this cardinal beetle. 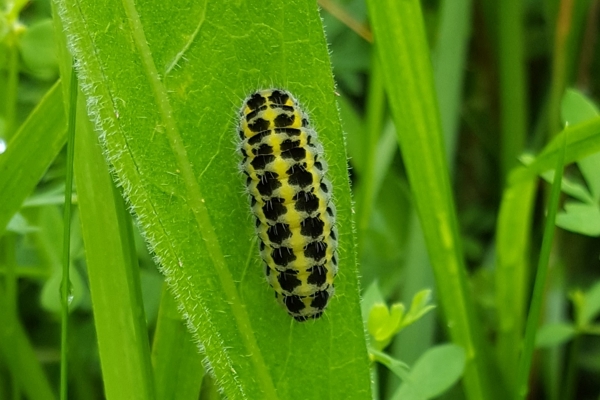 Conditions at Brockadale weren’t suitable for butterflies today but we saw a few things of interest. 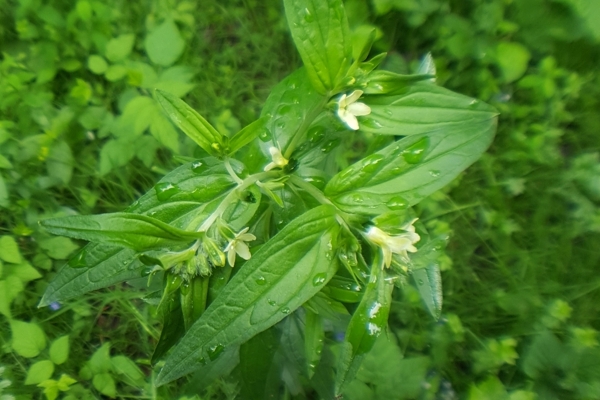 Common gromwell was in flower in the woods and we saw flowers on bugle and wood avens. 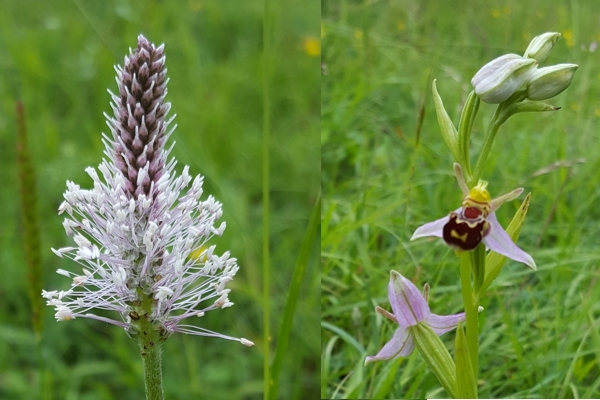 One or two hoary plantain were flowering and we located a few blooms on bee orchids. 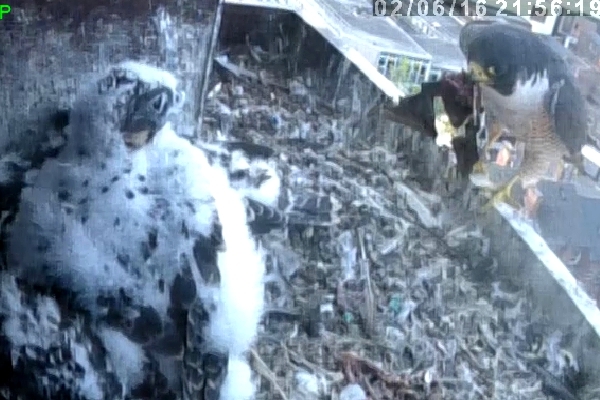 I have heard that peregrines can prey on bats, so I was interested to hear from two Wakefield peregrine followers on Thursday when they spotted what appeared to be a bat being brought to the nestbox by the male. A review of recorded footage earlier today confirmed the identification. The recordings show that the male concentrates on catching young starlings but he also brings in a real variety of prey items. Another species that was confirmed today was greenfinch.